As we enter into this year’s Advent season, this blog is a part of our series on the hope we find in, through and given by Christ, Each week’s installment will look at hope from a different perspective with special emphasis on corresponding passages of Scripture. 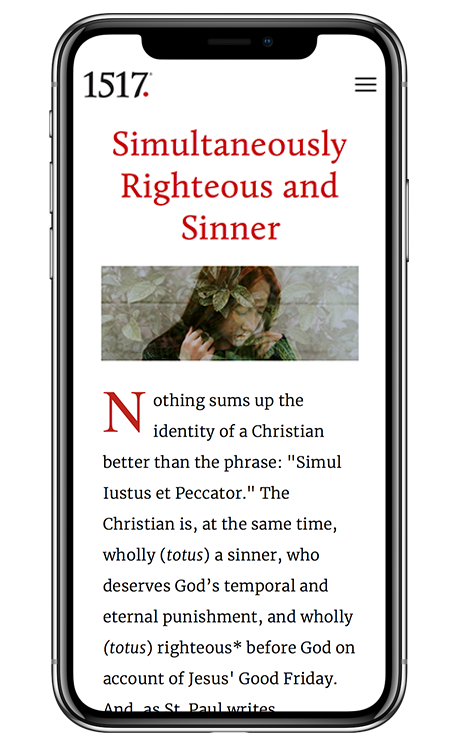 In the Reformation, core tenants of the Christian faith were summarized in short memorizable phrases declaring that we are justified by grace, through faith, on account of Christ. Outside of the truths proclaimed in each of these phrases, there is also significance to the prepositions that come before each of these Solas. The prepositions are significant because they define a relationship between two things. Therefore when it comes to theological statements, prepositions - such as by, through, and on - explain the relationship between us and God. Similarly, while a phrase like hope in the death and resurrection of Christ might seem self-explanatory, it is worth our time to explore what this means for sinners and their relationship to God. Faith, trust, and hope are united yet distinct concepts. Unlike faith and trust, hope by itself has a focus on entreaty. When we hope for something we ask and long for a particular outcome out of multiple options. In this sense, hoping is admitting that something is and can go wrong but remaining optimistic despite the possibility of a negative outcome. Some examples include: hoping that your child's team wins their basketball game, hoping that you get an A on an exam, or hoping that your spouse has a good day at work. Despite a level of uncertainty, in each of these examples, there are reasons to remain optimistic: your child practiced well, you studied hard, or your spouse heard that Christmas bonuses are coming soon. However, none of these results is a guarantee which is the reason why we hope for the best outcome. Remember how I said the prepositions are important? In all of these examples, we hope for something. But when it comes to Christ and his death and resurrection, we hope in someone. This one little word makes all the difference. When we hope in Christ, we are no longer yearning for a particular event to happen, but rather stand firm in the one who brought about our life by delivering us from the uncertainty of death. Few of us today know death as intimately as the generations that came before us. We are blessed to live in a time of relative peace, medical advancement, and awareness regarding human longevity. However, we are also cursed. Our ever-increasing fear of death drives endless attempts to make everything safe and push death off ever further in the distance. Yet what does the Gospel tell us? That even God incarnate did not outrun death. Instead, He embraced it taking on sin which was not His own, suffering for and alongside undeserving sinners. The death of Christ that is the death of God is good news because not only did He pay and reconcile for sin with death, He also conquered its power once and for all by rising from the grave. 1 Corinthians 15:3-4 declares, “For I delivered to you as of first importance what I also received: that Christ died for our sins in accordance with the Scriptures, that he was buried, that he was raised on the third day in accordance with the Scriptures.” Christ transformed death with resurrection so that we no longer fear the “sting of death” or the “power of the law” (1 Cor. 15:56), but instead have hope in the face of it. With men, death is the end of the story. The end of this life is where joy and hope come to a stop and pain and fear begin. Yet in Christ and His resurrection, death has lost its power. As the Apostle Paul reminds us when echoing the words of the prophet Hosea, “O death, where is your victory? O death, where is your sting?” (1 Cor. 15:55). The victory of Christ’s resurrection and the hope we have in it are delivered to us through water, word, bread, and wine. In Christ, death is no longer something we face alone. As the Apostle Paul states, “Do you not know that all of us who have been baptized into Christ Jesus were baptized into his death? We were buried therefore with him by baptism into death, in order that, just as Christ was raised from the dead by the glory of the Father, we too might walk in newness of life”(Rom. 6:3-4). Because we are securely joined to the death of God, we also take part in His resurrection and eternal life. The entreaty of our hope is not one of uncertain begging but is rooted in the certainty of the resurrection of Christ through whom we have been given the victory (1 Cor. 15:57). Caleb Keith holds a BA in theology and classical languages from Concordia University Irvine and is currently pursuing an MA in systematic theology from the University of Nottingham He is the producer of the Thinking Fellows podcast and a contributor at 1517 the Legacy Project.